A male model is posing for a fashion photographer by the stairs outside Union Station in Denver, Colorado. He is modeling for a men’s fashion line that specializes in tailored suits. He is wearing a classic three-piece suit in brown tweed with a blue shirt underneath and a contrasting tie. He has one hand inside his pant pocket while the other is holding onto the metal stair rail. He is looking straight at the camera with a serious expression on his face. 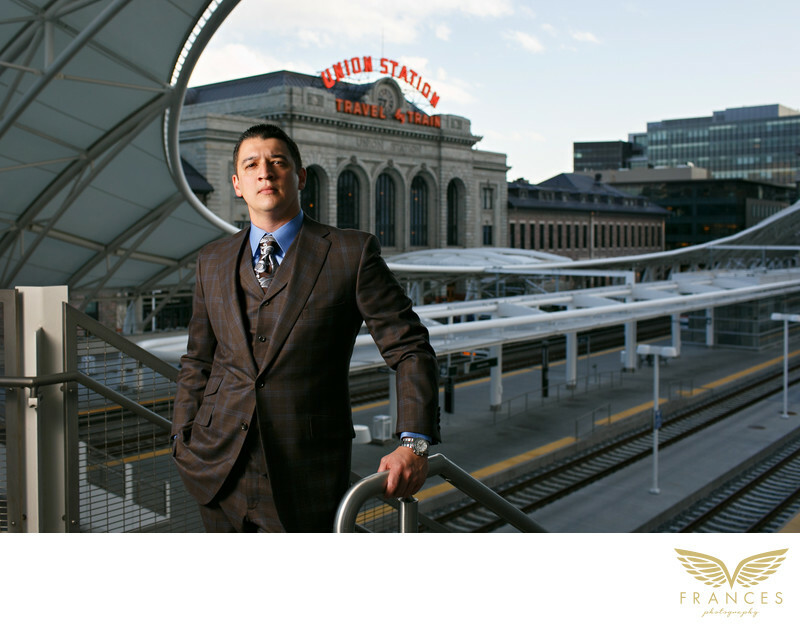 The background shows Union Station in downtown Denver, as well as its extensive transportation hub and some of the neighborhood’s buildings and sights. The model appears to have just come off the train and has been photographed as he descended up the stairs. His choice of wearing a dark brown suit in a thicker fabric nearly transports us back to a day when people dressed to the nines when traveling.